Tournament host Sergio Garcia won the Andalucia Valderrama Masters by one shot as he claimed the sixth victory of his career on home soil. The Spaniard, who won the 2017 Masters, carded a final round four-under-par 67 to beat Dutchman Joost Luiten. Garcia's one shot overnight lead was quickly wiped out by England's Daniel Brooks, but five birdies secured a third win of the season. Brooks finished four strokes further back in third. The result was good enough to secure his European Tour card for next season by moving him from 123rd to inside the top 100 in the Race to Dubai. "It was amazing," Garcia told Sky Sports. "All three of us [in the final group] played amazing. "I stayed patient the whole time, made sure the bad moments didn't affect me too much and made a couple of really key putts coming in. "I want to dedicate this one to my wife Angela and our little baby coming next year in March - this one is for them." 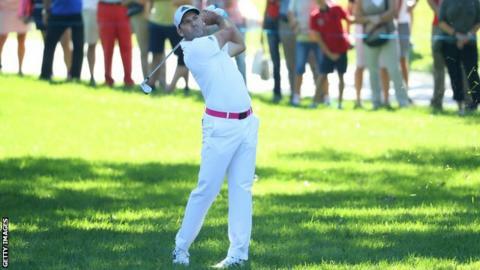 This is the first time Garcia, 37, has won three times in a single season, after his Masters triumph in April and victory in February's Dubai Desert Classic.